A flat, crisp, sweet cracker prepared with coarsely ground whole-wheat flour and honey. It is named after its creator, Rev. Sylvester Graham, a 19th century American nutritionist. 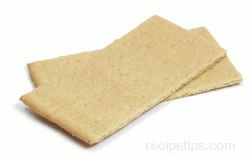 Graham crackers are a popular snack and can be crushed and used as an ingredient for various desserts.